Hillary, son Nolan, and Albert Garibay showing off Nolan’s first art project. At Mt. Helix Academy, our families work hard, sacrifice to have their children attend, and they are very active in supporting their children’s educational growth. We are very pleased to be able to feature some of our families on our website. 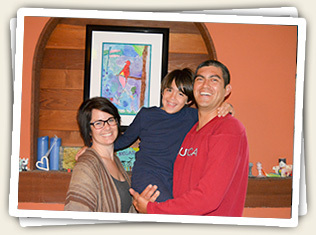 The spotlight is currently on one of our very dedicated families – The Garibay family! Mt. Helix Academy is pleased to present to you our featured family, The Garibays. Hillary works in marketing for Barona, Albert is a firefighter with the Barona Fire Dept. and Nolan is a 2nd grader at Mt Helix Academy. Chances are, if you are a Mt. Helix Academy family, you already know the Garibays or they are at least recognizable, as you will often see their smiling faces as they volunteer at various school events. Nolan’s equally happy face brightens our school and he is an active participant in the annual musicals, including his terrific performance as bad boy eagle Vlad Vladikoff in this year’s production of Seussical the Musical. Let’s learn more about the Garibays! What brought you to Mt. Helix Academy? Hillary: “I saw the school when I was pregnant with Nolan and I checked into it. I told Albert I think I found Nolan’s school. I really liked the idea of the constant evaluation that happens at MHA. I also had the school recommended to me by a co-worker and we got to know Mrs. F and Mrs. Browne at Starbucks before we ever attended the school! Nolan, what do you like about going to Mt. Helix Academy? According to Hillary, Nolan made his solo singing debut a couple summers ago at a YMCA camp where he hopped on stage and sang for the campers. Nolan’s musical theatre talent can be traced to mom, Hillary who performed in Babes in Toyland and Dracula the Musical in high school. Albert grew up a jock and after high school he played basketball with Torreon, a professional team in Mexico. Hillary attended Boise State University. Albert and Hillary, how did you meet? The Garibays also have a rescue dog, Lucy, and they have spent numerous hours volunteering and raising funds for the PKD Foundation. They don’t hide their love for the people at Mt. Helix Academy. While the Garibays are very happy that Nolan attends MHA, we are also very happy to count them among our families. Nolan is such a happy and eager student and it seems like every time volunteers are needed, the Garibays are among the first to offer their help. Albert is also in charge of MHA’s very popular Pizza Friday and he has volunteered his time to come into classrooms and teach students about fire safety. We are very glad you are here, Garibays!